» By Bike or on Foot! Cyclists and Walkers Are Guided to Learn about Healthy Food and Safe Transit in South LA Ride South L.A.
Last Sunday, on November 4th a group of enthusiastic cyclists and walkers gathered together at Mercado de Paloma to be guided by the RideSouth LA coalition to explore South LA on safe bike and walk routes that investigate the healthy food options around the area. As opposed to our last walk and ride, cyclists tremendously outnumbered the walkers. With around 30 participants on bikes and a cadre of 5 walkers – both groups were ready to enjoy a explore what healthy food in South LA looks like. The walkers set off with the primary purpose to examine the differences between two major supermarkets in the area – Fresh & Easy and El Superior. 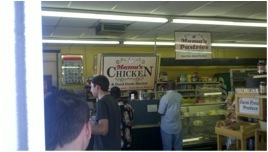 These two markets are very different in terms of size, food offerings and customer base. 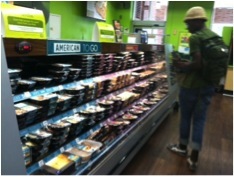 Fresh & Easy is much smaller and targets on-the-go students with many ready-to-eat meals in their food selection (see picture). El Superior on the other hand is a much larger store with many more options and catered to many of the Latino families in the neighborhood. So, next let’s see what the cyclists were up to. It was not just any ride – we had two skilled community bike clubs from South LA leading the way in an impressive model that evidenced their seasoned expertise. East Side Riders (ESR) together with Los Ryderz presented an impressive image of both discipline and fun, riding down Exposition Blvd at midday on Sunday. Their first stop was the Exposition Fish and Poultry market, offering free-range eggs and organic Chicken to their customers – healthy food in South LA! Overall it was a great successful day for both cyclists and walkers. The lessons we learned on this day out are that riding in a group is a very safe way to bicycle – drivers see you and seem to be very patient. 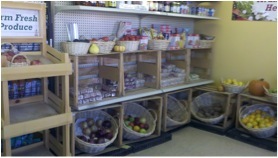 We were also happy to notice that people seek healthy foods, which was supported by the number of customers at both stops. The healthy food stops that were visited on Sunday will be featured on our Healthy South LA Food map that you can access here. If you didn’t get a chance to come out with us Sunday, download the map and take a walk or bike ride to learn about Healthy Food options in South LA! Stay posted for updates and future events!